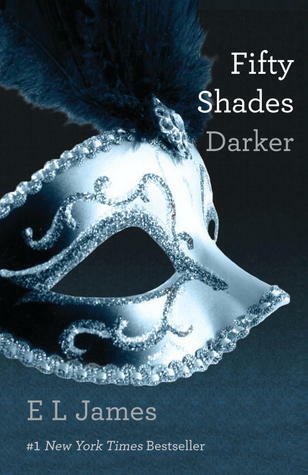 ...the future of the relationship which leads Ana to dig deeper to the darker side of Christian Grey. Maybe that's why, the second book, it's called...darker. Christian Grey, finally, shows up his persistence not to lose Anastasia Steele. The billionaire CEO tries to stand up and gather his scattered soul for Ana and moving on together. The journey back involves swimming back to his past, although he isn't alone to solve the puzzle, but in the mean time, Ana is also stepping to building career phase. Not only having protective Christian who can do almost anything for her safety, professionalism against the boss' interest on her becomes one other piece in mind to balance. In spite of the welcoming Grey family, Ana realizes that she has a lot to fight---Christian's ex-submissive who comes a threat in a sudden, gold-digger image, and Christian's trust. Knowing Christian's fact of psychological condition, Ana will have to accept the cause of his secret interest in the end, leaving Christian nothing to fight, except his own fear and past. Still written with strong and explicit steamy sexual scenes, E. L. James somehow brings the readers to follow the darker path of the main character, which is Christian. As for Ana, she slides down to be a supportive key only. Nevertheless, the main point of the long-going drama is felt better and clearer in this book, compared to the first one where the story is just felt as game of amusement, but Fifty Shades Darker lifts up one message of psychological drama-alike. E. L. James in the second book rose her belief in Freud's comprehension of childhood trauma. The theory the author used to build up Christian Grey's background character then had simply created the whole story of the Fifty Shades trilogy. It has actually opened the darker part of the series. Even the readers' question on Christian's past almost completely got answered, the joy of reading the story till the third book will not surely fade! Compared to the first book, feminism is rather a bit weak in the surface, yet stemmed stronger inside Ana's character. Being given more faith, patience and understanding, Christian, however, still falls short of controlling his ego to control and even to protect Ana. Concept of fairy tale princess and prince charming wins two third of the book. Ana still struggles for equality through her softest way. Omg, I love your updated blog, a lot! I loved, loved, LOVED the Fifty Shades of Grey series. Christian is just so dark and fragile, but he's confident too. He's just SO mysterious. New follower from Book Blogs, by the way. Forever stalking - (I mean following) your blog. I'm now a proud new follower of your blog, and I love your layout and designs! Do drop by mine @ bookaworld.wordpress.com too!